Audience responses to NO JOKE, a series of enigmatic photo collages by American photographer Roger Ballen and Danish artist Asger Carlsen, divide neatly into two categories; either you'll be curious and stare, or you'll be repulsed and look away. This polarity makes sense; they aren't easy works to look at. 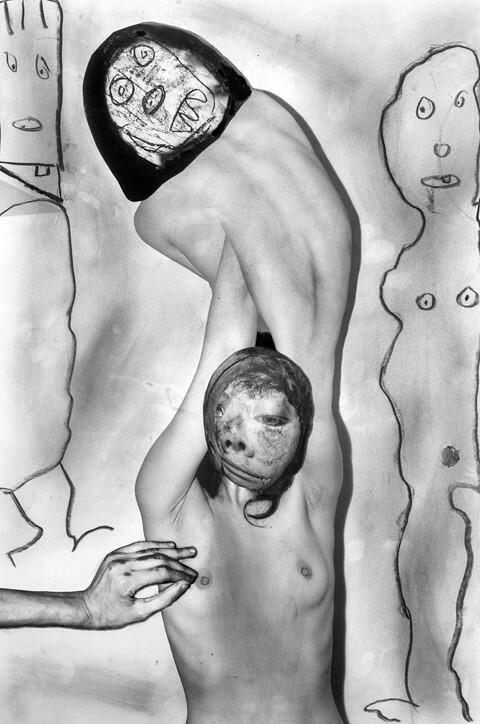 Bizarre visages and primitive drawings float around warped naked bodies. Deformed mannequins are juxtaposed with grimacing animals against dilapidated backdrops. Facets of everyday life collide with fragments of the mind in chaotic scenes where everything feels familiar, and yet incongruous. 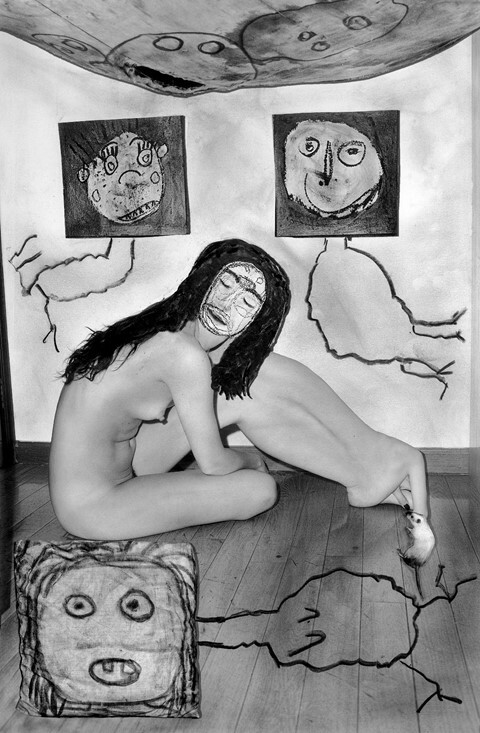 Similar to the surrealist cadavre exquis – a chance-based parlour game which involved passing a piece of paper between a group where each participant contributed a drawing – the images were created collaboratively, and appear to be interpolated between the exterior and interior worlds. For NO JOKE, showing at the moment at Berlin’s Dittrich & Schlechtriem Gallery, Ballen and Carlsen worked together to produce a series of 37 black and white photographs that attempt to divert our gaze inwards, towards the darkest recesses of the psyche. The off-kilter photo-collages stem from a long-distance collaboration the duo established in 2013 when they began exchanging ideas and visual material with each other online, with Ballen based in Johannesburg and Carlsen in New York. 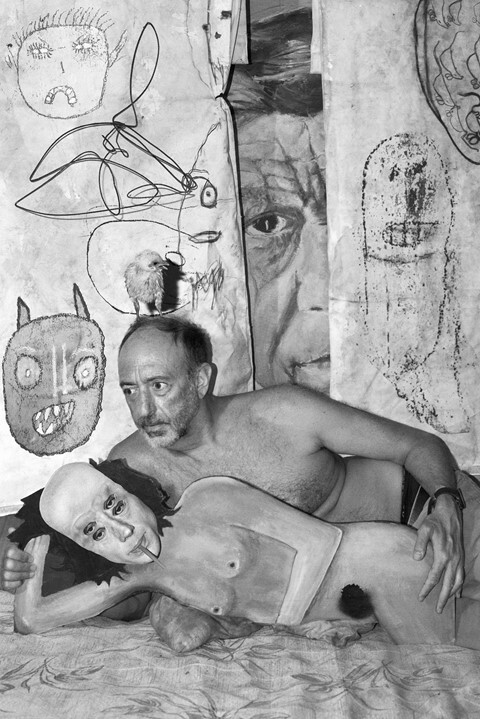 In each pass, the artworks were manipulated, layered, drawn over and reconstructed with digital processes as well as analogue techniques. The resulting pieces are a concoction of material and media that seem to transcend the rigid patterns of rational thinking and leave us on the brink of an unknowable abyss. Truth be told, not all indefinable art is capable of penetrating the psyche. Nevertheless, there’s a freedom in Ballen and Carlsen’s fused aesthetic that mirrors the inexplicable way that trails of thought, memory and dreams emerge, mingle and mesh with one another. The textures of visual elements, tactility of flesh and weight of drawn lines seem to embody the rawest of human emotions and linger in the mind long after seeing them. Although words like "dark", "disturbing" and "monstrous" are often associated with the pieces created by Ballen and Carlsen in their individual practice, the duo insist they don’t see their work in that way. Instead, they think this interpretation reveals more about viewers and their fear of looking within, than the intentions of the creators. When asked about these cynical perceptions of their artworks, Ballen told AnOther, "Darkness has nothing to do with the essence of truth. Life is not light or dark. Life is just life." Gazing at the incoherent images and stark self-portraits, I can’t help but think of the shadow – a Jungian concept referring to the hidden elements of the personality that one refuses to acknowledge because of its incompatibility with our conscious attitudes – and the Western dichotomy of good and evil. In a sense, NO JOKE is an attempt to cope with the absurdity of the human condition, to face the nocturnal sides in all of us and to bring viewers a bit closer to their interior lives. By revealing aspects of their innermost being and demonstrating a lack of recrimination in themselves for doing so, Ballen and Carlsen have created brazen worlds that surpass comprehension and strive to confront the mental hinterlands we’re often encouraged to suppress. NO JOKE runs until October 22, 2016 at Dittrich & Schlechtriem Gallery, Berlin. A follow-up presentation is selected to be featured at Paris Photo 2016 in November.